The futuristic Artificial Intelligence technology is already making life easier by solving complicated tasks in various tech fields. Many big companies have realized the importance of AI for future and some have already started to develop their own AI systems. Now AI has entered home appliances sector with Samsung’s new WW8800M quick drive washing machine. Quick Drive washing machine technology has reduced laundry time by half without compromising on wash quality and efficiency. The machine uses Q-drum technology which rotates main drum and back plate independently creating top-bottom and horizontal movement. The Samsung WW8800M washing machine also uses eco-bubble technology which creates bubbles by mixing air for more effective cleaning. The fastest super speed program is able to wash your clothes in just 39 minutes which is almost half of the time taken by traditional washing machines. The machine also has many other programs like stain removal and hygiene. The new ceramic heater+ uses a special coating which is effective in reducing scale buildup. 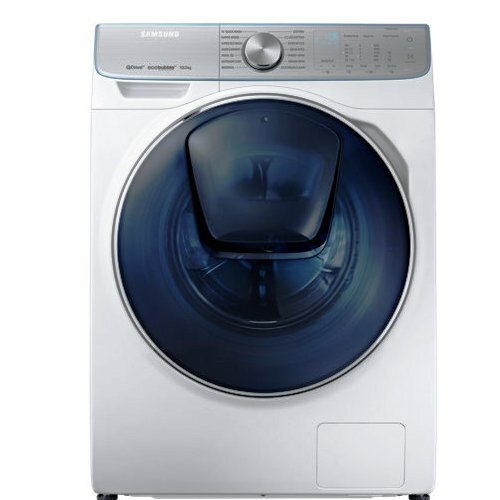 Samsung WW8800M has washing capacity of 10 kg while the weight of washing machine is 83 kg. The machine uses AI-powered laundry assistant which helps in optimizing the wash cycle by taking data inputs like colors, laundry type and level of soiling. This assistant also provides the ability to set washing schedule and shows finish time.